Hello, I've recently upgraded to wine-1.1.37 in order to get EVE online to work, and now when I go to the login screen for EnB it comes up with the "unable to connect to EA server, INV-300 Error" message. Any suggestions/help would be greatly appreciated. Little more info, I'm running Ubuntu Linux 9.10 with latest updates. Well INV300 can be caused by having a proxy set, it can be caused by not having installed the certificate (included in the patch on your net7 directory). I've never tried connecting using linux - my experience with linux hasn't been that great - whenever I eventually worked out the relevant rituals to get anything useful to work *something* deep within the OS would crash and require either hours of prodding or a re-boot. I think there used to be a couple of wine-users in the game but not sure if they're still around. The arcane guides they wrote were probably lost in the thrice accursed server crash unfortunately. Do you have a dual boot with XP on it? That's probably your best bet. 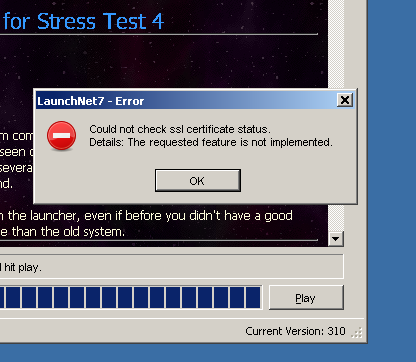 the reason linux/wine does not work out of the box, is that play.net-7.net is using invalid certificate. previously it was expired, now it's for local.net-7.org domain, but used on play.net-7.org. to op: downgrade to wine 1.1.34. Tienbau: I have linux to get away from windows. Karu: Since EVE online barely works on 1.1.37, downgrading isn't really an option. I tried to install the certs via Explorer in wine, but no luck there. I get a "WINE: Success!" message box, but nothing else. Since EVE online barely works on 1.1.37, downgrading isn't really an option. place wine-1.1.34 under $HOME/bin/wine-enb or something. adjust paths in script below. From your answer i guess you are using EnB under WINE ? If you manage to get it run, could you get a look at the problem(s) a few of us have in the sticky about EnB on WINE ? And if you could run a quick how to it would be even better. Any idea as to how exactly I would install wine under a different directory? I'm not THAT linux savvy. Thanks in advance. The other solution you *can* use is a little bit of a cheater trick i've used for testing things. Simply put in your linux install drive (USB, disk, doesn't matter) go into Manual when it asks how to divide the partitions up, create a small 6-8 gig partition, install linux on that and use that section for EnB. Yes, i realize that the combination of linux and EnB is only about 5 gigs, but you want extra space for future updates and what not. Ok I'll give downgrading a try, was using wine 1.2-0ubuntu6~lucid5. How did you know to use 1.1.34 and what should I google for further reading on the topic of what changed in wine after 1.1.34? I carefully installed wine-1.1.34 as it's own prefix, and now I still keep getting the INV-300 problem when trying to log in. Damn. Hmm. Try running the E&BConfig tool (located in the "Earth & Beyond\EBCONFIG" folder) and setting "Filter Mode" to Bilinear and "Color Depth" to 16-bit. Also, experiment with different resolution settings. Does that "fixme" error come up when starting the game or when you get the INV-300? d3d is Direct3D and harmless. I see; based on this specific win inet error, you would probably need to install the certificate into the "Trusted Root Certification Authorities" certificate store, though I haven't the slightest clue what the procedure for this is with wine. Have you tried this with more recent versions of wine? 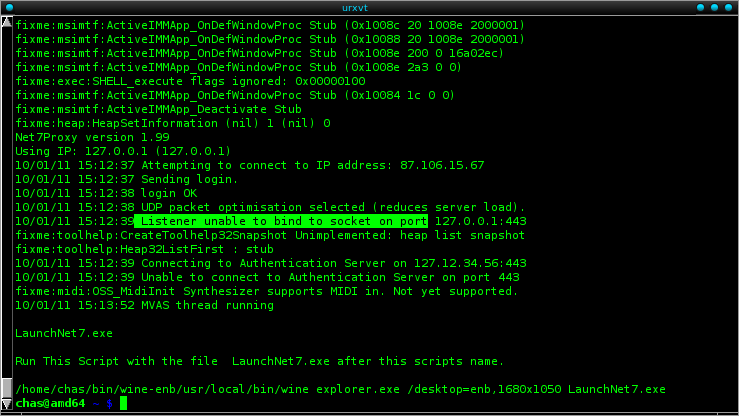 Somehow I'm still not able to play in wine-1.1.34, so I have to wonder what SSL are you using on your 1.1.34? *just notes here, not a howto since no positive result thus far. Here are some notes I've gathered for enb on linux via wine. who ever is the dev on this might try some testing on a ubuntu lucid lynx box with standard package of wine and openssl package. Then he/she could really prod around until things work better. This went along as depicted below. You can see (above) that the cert was added but not able to be put in the "root certificate home," notice the red x on the icon. So I went on to do the following. "Importing a Certificate into the System-Wide Certificate Authority Database"
I should finally point out that all of this hasn't worked for me so far so don't take this post as a howto, just as clues and info. I really want enb to work easily on wine, even standard packages on standard ubuntu versions, as do we all. in the name of Megan, why do you have 'Local Cert' selected ? OpenSSL lib version does not matter. fixme:midi:OSS_MidiInit Synthesizer supports MIDI in. Not yet supported. 13/01/11 01:13:35 UDP packet optimisation selected (reduces server load). 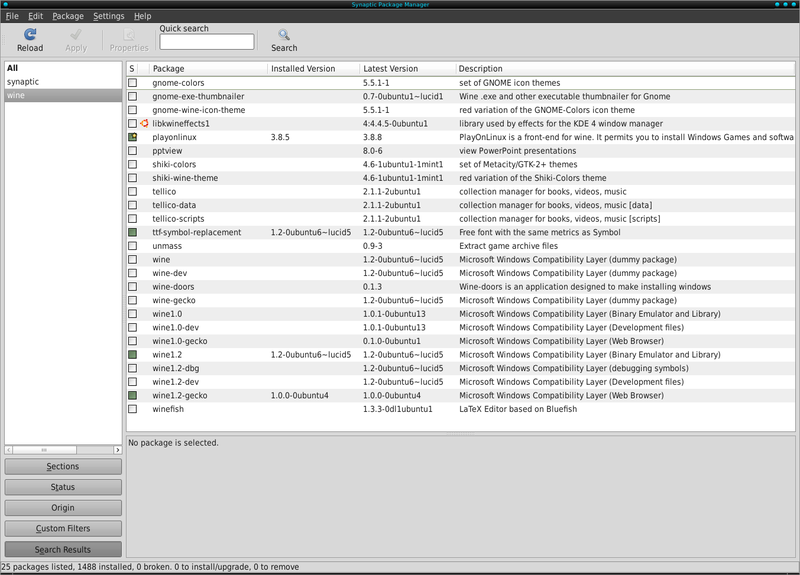 This is how I have set the options in LaunchNet7.exe dialog, after Karu's suggestions. Still I get an ENV-300 screen. then no 'make install' because I have wine 1.2.0 already packaged in, so this wine 1.1.34 is just a side install. I guess I'll have to try a fresh install of wine-1.1.34 as soon as I get some more time.